Tel Shiloh was the religious capital of Israel after the conquest of Canaan, and the assembly place for the people of Israel. Joshua 18 1: "And the whole congregation of the children of Israel assembled together at Shiloh, and set up the tabernacle of the congregation there". Tel Shiloh was the religious capital of Israel during the times of the Judges, and spans 4,000 years of continuous settlement starting from the 18th century BC (Middle Bronze II). Shiloh was an assembly place for the people of Israel and a center of worship. 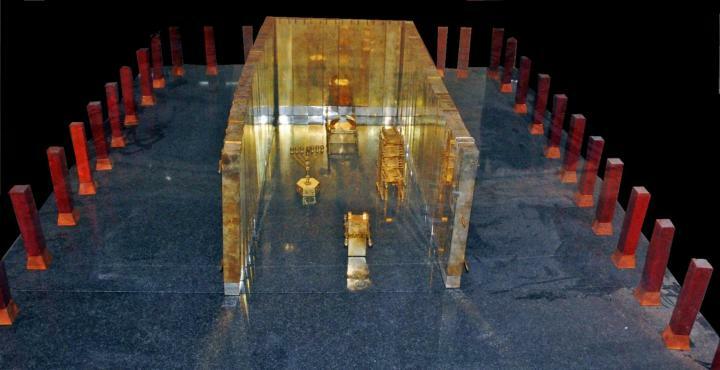 Its sacred area (Tabernacle - Mishkan) in Shiloh housed the Ark of Covenant, Table of Showbread, Altar of Incense and Golden Lamp stand. Shiloh is sacred to the three religions - Jewish, Christian and Muslim - and pilgrims come to visit the ruins for the past 3,060 years. On the south-east side of Tel Shiloh are ruins of Mosques and Churches and a modern Synagogue. Shiloh is located 17km south of Shechem, and is accessible from the city of Ariel. The ruins of Shiloh are part of the archaeological park of "Ancient Shiloh", which is located in the entrance to the modern community of Shiloh. 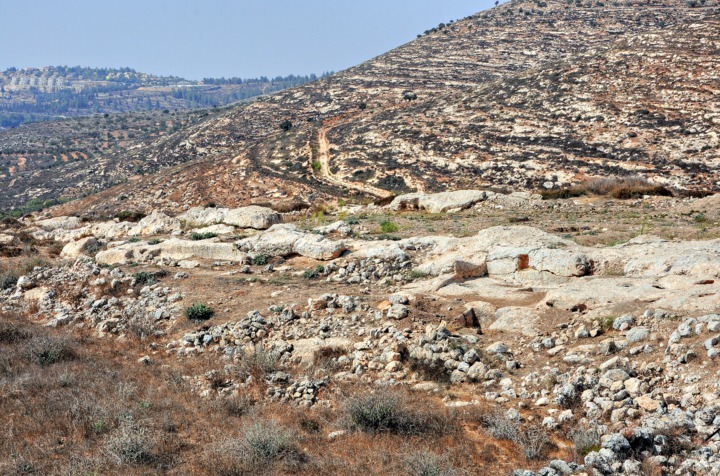 Tel Shiloh is located on a hill, 714m above sea level - about 40m above the area around it. The access to the hill is on the south side, by a road which starts from the visitor center. The aerial view shows the major points of interest, and the areas of the excavations (C thru K). 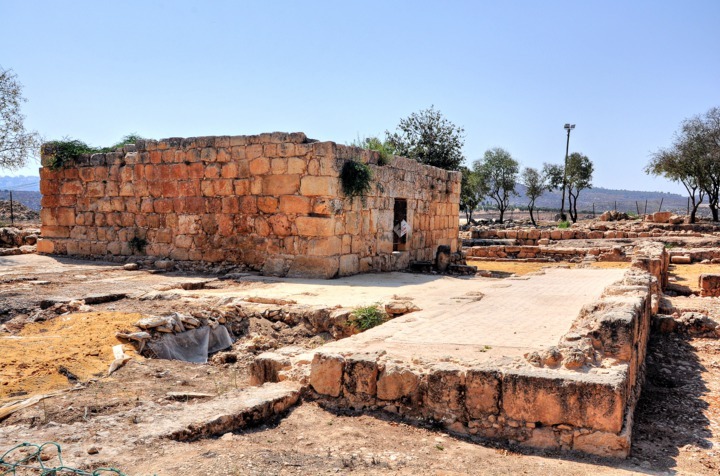 During the Middle Bronze II period (2000-1600 BC) the region witnessed a large settlement wave, when new cities were founded in the high mountain area of Judea, Ephraim and Benjamin - such as Jerusalem, Shechem, Tirzah, Hebron and Bethel. 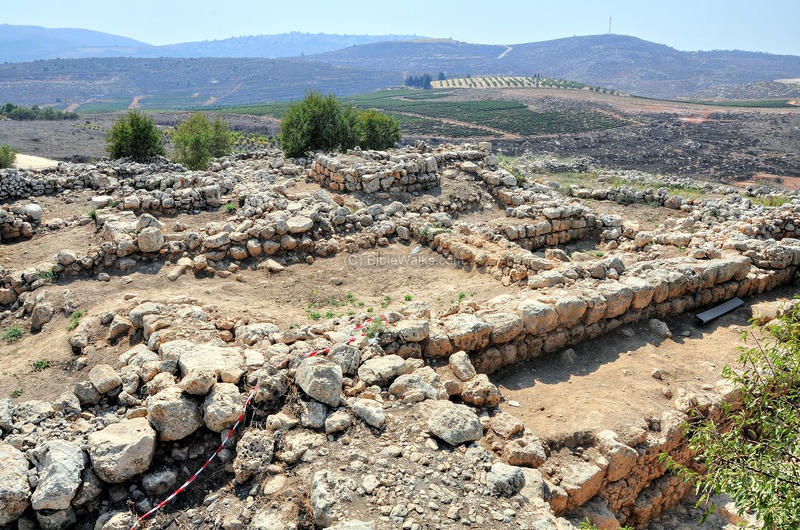 One of these new cities was Shiloh, located in the fertile valley of the area of Ephraim between Shechem and Bethel. 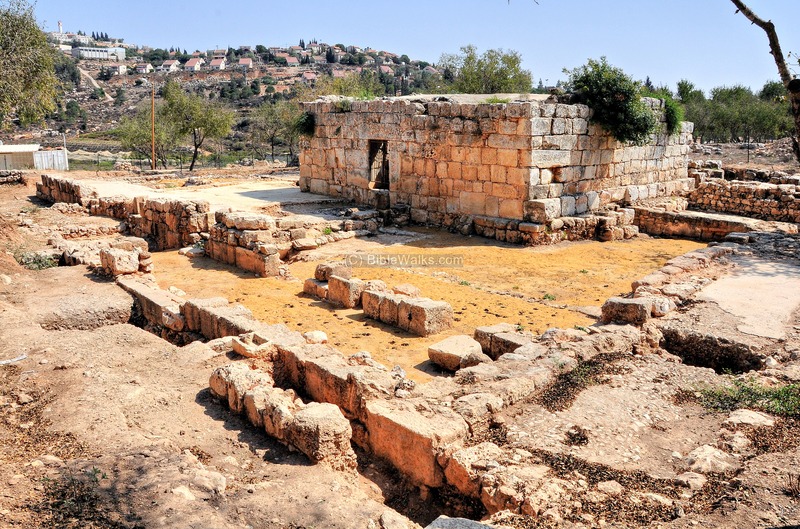 A large city was founded in Tel Shiloh during the Middle Bronze II period (18th century BC). 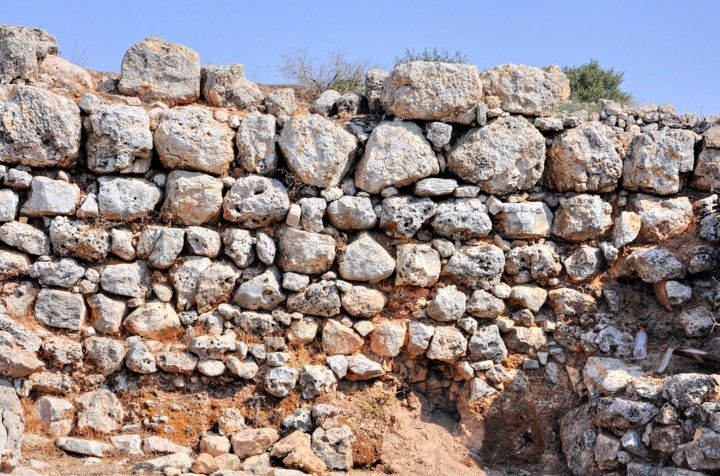 A massive wall was later erected during the 17th century BC, which surrounded the city. The wall was 8m high and 3.0m-5.5m wide, and protected by a 25m wide earthen glacis which reached 1m under the top of the wall. 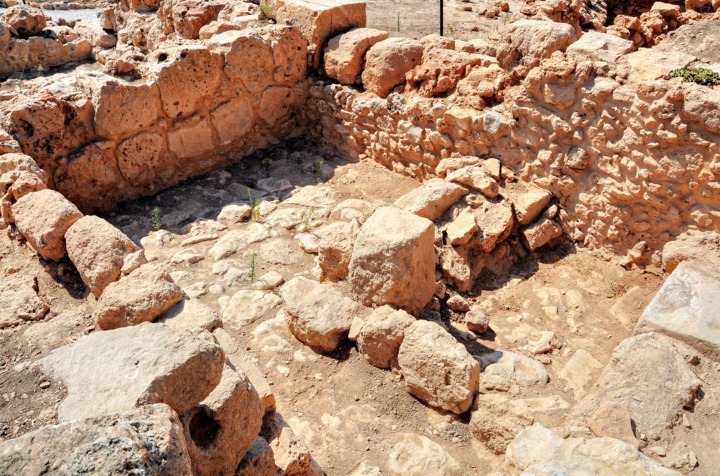 The small size of the inner city and the finding of a cult object (statue of a bull), as well as other ritual vessels, may imply that Canaanite Shiloh was a ancient center of worship. Its altar was probably located on the north-west side of the mound (near area "F", where several rooms were found with ritual objects). Perhaps, this was the reason it was later selected by the Israelites to serve as their central religious city. During the Late Bronze period (1550 BC-1200 BC) the settlements in the region of the high mountain deteriorated. Many of the small cities were deserted, and the region was under Egyptian control since the great battle in Megiddo (1468 BC). The strongest city in the area of Ephraim and Manasseh was Shechem, which expanded its control over the entire area between Jerusalem in the south and Megiddo in the north. On the other hand, the Canaanite city in Shiloh has weakened. When the Israelites started to settle the area at the end of this period, the Canaanite presence around Shiloh was scarce. During Iron age I (1200-1000 BC) the region of the high mountain area witnessed a new wave of settlement, following the conquest of the Land by the Israelites. Dozens of villages were established. According to many scholars, the core of the Israelites settled in the area of Manasseh and Ephraim, and only later expanded to the south (Benjamin and Judea). Therefore, the capital city was selected to be in Ephraim, and only at the end of this period it moved to Jerusalem. 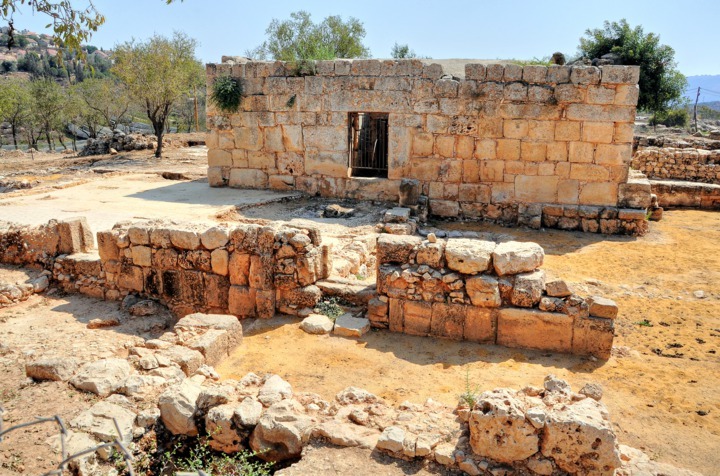 Shiloh, located in the region of Ephraim, became the religious capital of Israel: it was the assembly place for the people of Israel, a center of worship, and housed the Ark of Covenant. It is referred in many places in the Bible, such the visits of Elkanah and Hannah when they prayed for a son (1 Samuel 1 1-3): "Now there was a certain man ... his name was Elkanah... And he had two wives; the name of the one was Hannah...but Hannah had no children....And this man went up out of his city yearly to worship and to sacrifice unto the LORD of hosts in Shiloh. And the two sons of Eli, Hophni and Phinehas, the priests of the LORD, were there". Their prayers were answered, and Hannah gave birth to Samuel (1 Samuel 1 20): "Wherefore it came to pass, when the time was come about after Hannah had conceived, that she bare a son, and called his name Samuel, saying, Because I have asked him of the LORD". 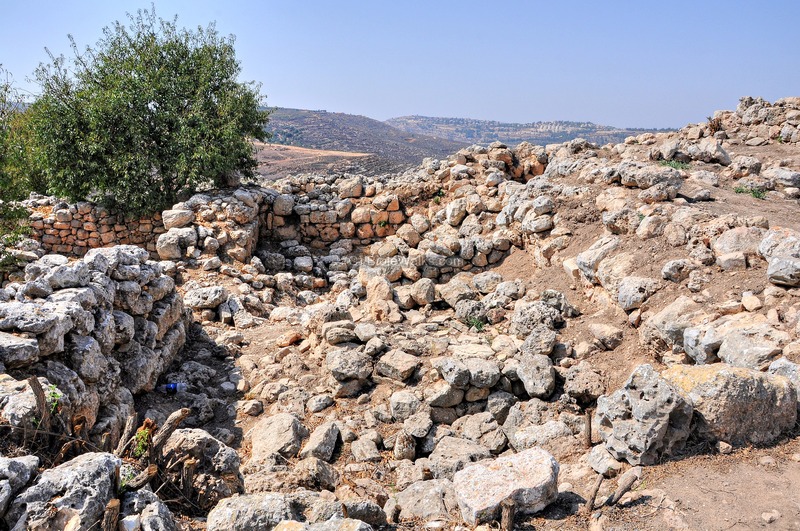 The location of Shiloh is clearly identified in the Bible (Judges 21 19): "Then they said, Behold, there is a feast of the LORD in Shiloh yearly in a place which is on the north side of Bethel, on the east side of the highway that goeth up from Bethel to Shechem, and on the south of Lebonah". Since the location of all three of these sites are known, hence Shiloh's location is clear. Its location is shown in the center of the Biblical map below. At Shiloh the people of Israel assembled and the Land divided among the tribes (Joshua 18 1-2,5): "And the whole congregation of the children of Israel assembled together at Shiloh, and set up the tabernacle of the congregation there. And there remained among the children of Israel seven tribes, which had not yet received their inheritance... And they shall divide it into seven parts...". 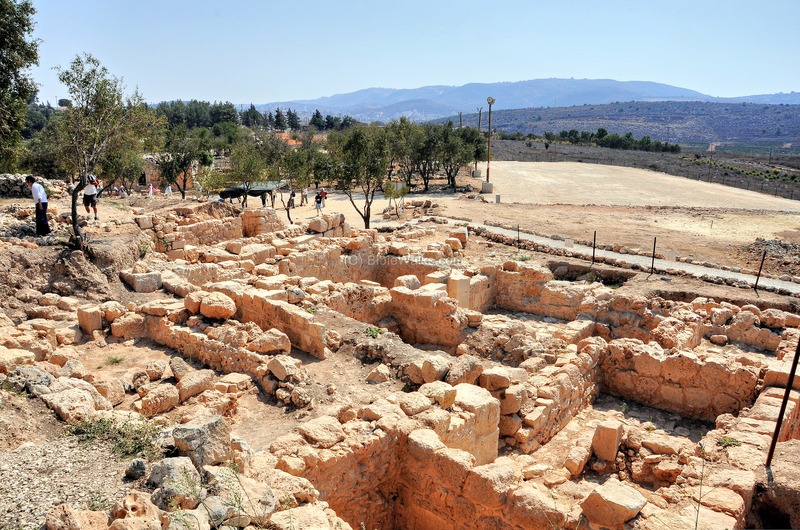 The city was unfortified during the Iron Age. 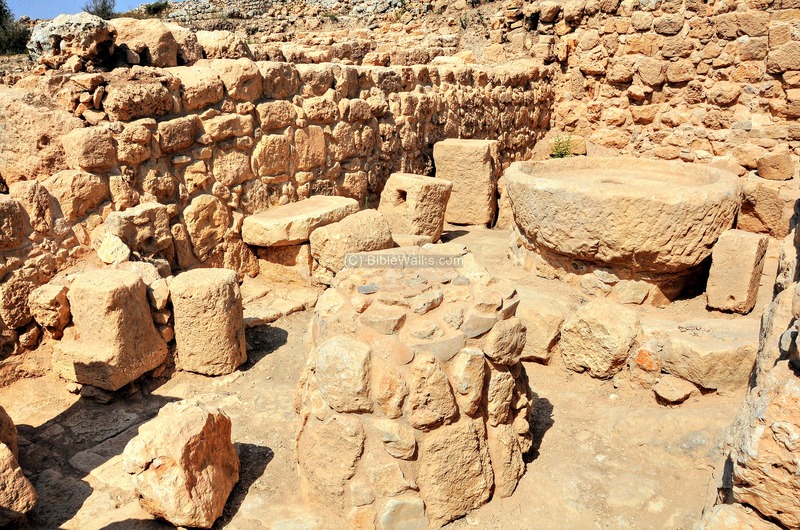 Residences and structures were built into the earlier Canaanite wall and glacis. 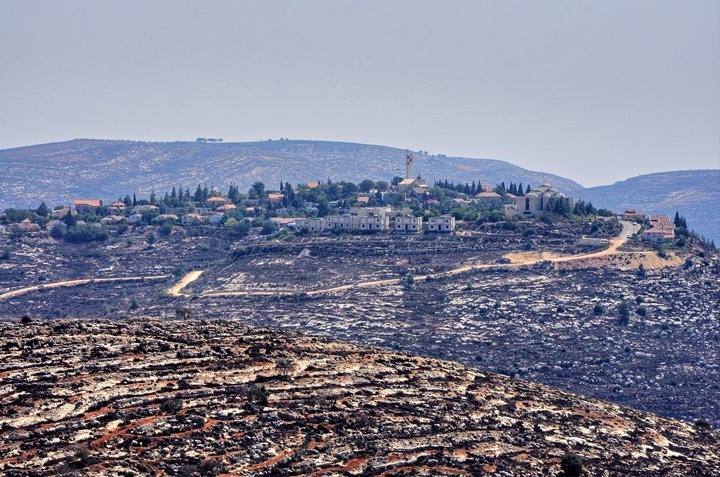 Shiloh continued to serve as the religious capital for 369 years (according to traditions), or about 150 years (according to historians), from the conquest of Canaan until the end of the time of the Judges of Israel. Following the battle of Ebenezer (~1050 BC) Shiloh was burnt and destroyed. The excavators found a huge (1m) destruction layer dated to this period. The great battle of Eben-Ezer occurred in the middle of the 11th C between Ebenezer and Aphek, at about 1050 BC. This battle is fully detailed in the Bible (1 Samuel 4 1): "Now Israel went out against the Philistines to battle, and pitched beside Ebenezer: and the Philistines pitched in Aphek". The Bible describes the course of the battle, and its tragic results: 34,000 Israelite soldiers dead, the two spiritual leaders (sons of Eli) were killed, and worse: the Ark of Covenant, which was brought from Shiloh to encourage the army, was taken by the Philistines (1 Samuel 5 1): "And the Philistines took the ark of God, and brought it from Ebenezer unto Ashdod". The Philistines purged all the way to the heart of Samaria and destroyed Shiloh at some time after the defeat (Jeremiah 7 12): "But go ye now unto my place which was in Shiloh, where I set my name at the first, and see what I did to it for the wickedness of my people Israel" and (Psalms 78 60): "So that he forsook the tabernacle of Shiloh, the tent which he placed among men". After years of neglect, the city was resettled during the 8th century BC or earlier. Several structures were found from this period. This period ended with the Assyrian conquest. 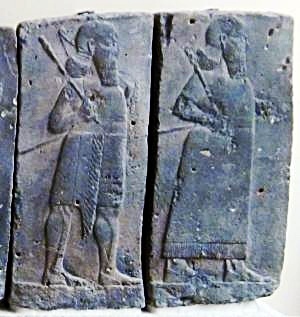 In 732 BC was an intrusion to the North of Israel by the Assyrian King Tiglath-Pileser III, who annexed the area (as per 2 Kings 15: 29): "In the days of Pekah king of Israel came Tiglathpileser king of Assyria, and took ... Galilee...and carried them captive to Assyria". This intrusion affected the north of the Kingdom, but Samaria was spared since the Assyrians stopped at Megiddo then continued along the shore to Egypt. Shiloh, like other cities and villages in Samaria, was destroyed. 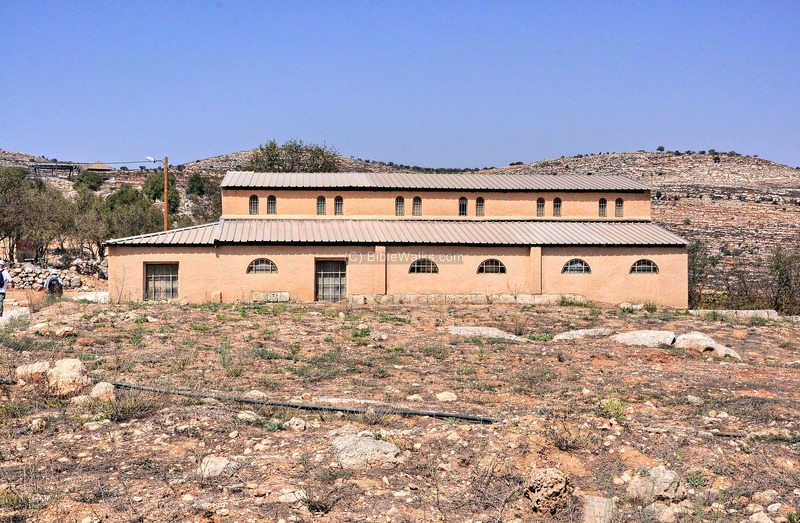 The site was resettled during the Roman and Byzantine periods, when it reached a high point of development. 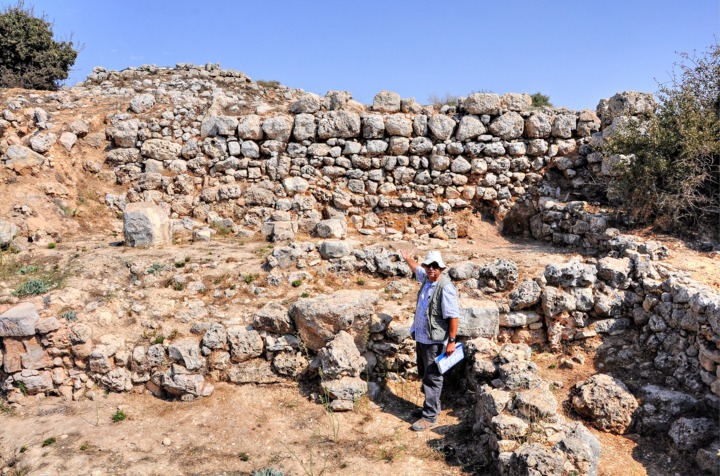 Four Churches were built on the south side of Tel Shiloh, the earliest in the 4th C and the latest one in the 6-7th century AD. 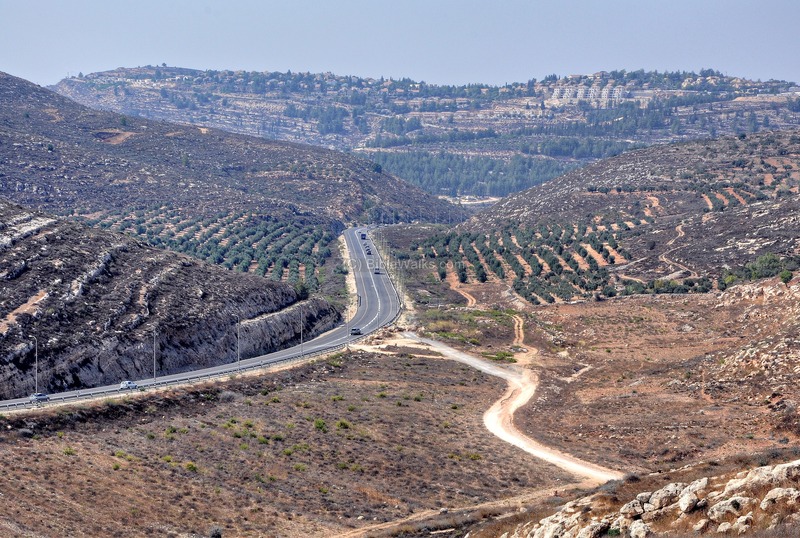 Shiloh is located on the backbone of the high mountain area of Samaria, and in ancient times a major road passed near Shiloh (Judges 21 19): "a place which is on ... the east side of the highway that goeth up from Bethel to Shechem". This route was used also during the Roman period, as the road passed 2km to the west of Shiloh, connecting Jerusalem to Shechem. The location of Shiloh is marked by a red square on the Holy Land section of the Peutinger map. "Seilun - The position of this place is remarkably retired, shut in between high bare mountains, which intercept the view on every side. The ruins stand on a rounded Tell, with a deep valley at the back (about 50 or 70 feet below the top of the Tell) ; they consist of ruined houses of a modern village, with here and there fragments of masonry, which may date back to Crusading times, especially one sloping scarp. At the back of the village on the north is a sort of terrace with rocky sides, and other terraces below. This terrace is 77 feet wide north and south by 412 feet long, and the rock at the sides stands up in places towards the east as high as 5 feet above the arable ground of the terrace. There are said to be only a few inches of soil in the space between these scarps, and there are several small cisterns close by. Major Wilson proposes to recognize this as the place where the tabernacle stood. The spring of Seilun is three-quarters of a mile north-east up a narrow valley, the sides of which are flanked by rock-cut tombs, much destroyed. The water is good, and runs through an underground channel towards a rock-cut birkeh. One tomb near it, hewn in a detached block of rock, is peculiar. It is partly destroyed, but consisted of two chambers, with a loculus sunk in the top of the rock. There is also a tomb west of Seilun in the side of the valley leading towards Lubban. There are traces of an ancient road leading to Seilun from the south, the roadway 10 feet wide". 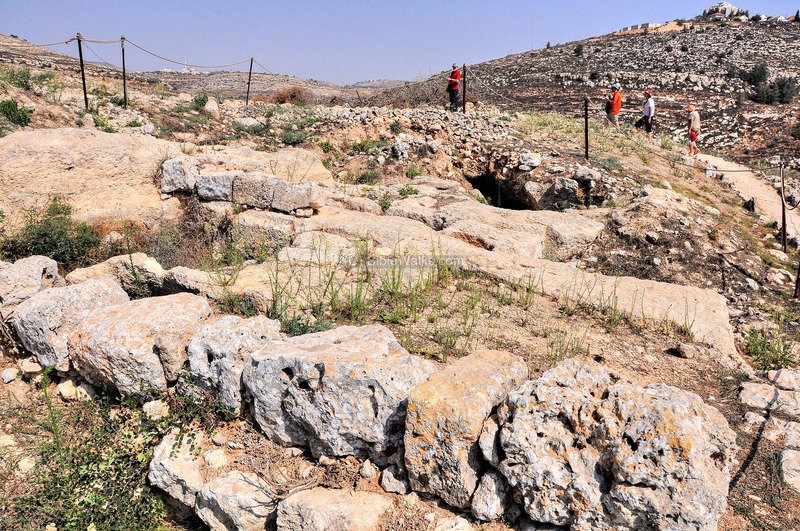 "Khurbet er Rafid —Foundations and heaps of stones, having an ancient appearance. There are rock-cut tombs in the valley immediately north". "Kuriyut - a small village, on the top of a high chain, with a spring between it and the ruin of Seilun. This place, being at the head of Wady Fusail, seems to have given rise to the mediaeval identification of that valley as the Brook Cherith (mentioned by Marino Sanuto in 1321). Kuriyut is supposed by Robinson to be the Corea of Josephus (Ant. xiv. 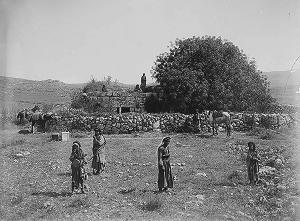 3, 4), on the boundary of Judea". "Sinjil —A village of moderate size, straggling along the hill-side, with several houses of two storeys, on the slope of the hill, with fine fig gardens below. It has a well on the south-west. This place is apparently the Saint Gilles mentioned by Fetellus between Jerusalem and Sychem. It obtained its name from Raymond de St. Gilles, fourth Count of Toulouse.... On the summit of the hill are observed the foundations of two strongholds, built of great blocks, evidently ancient, one of which is called the Kasr (" Fort "), and the other the Keniseh ("Church"). The latter is, in fact, built east and west, and may have been a church. On the lower flanks of the hill I found several ancient tombs cut in the rock. One of the largest, preceded by a vestibule, contains two loculi (report by Gurin)". "Turmus 'Aya - a village on a low knoll, in a fertile plain, with a spring to the south. The village is of moderate size, and surrounded by fruit trees. On the south at the foot of the mound is the conspicuous white dome of the sacred place. 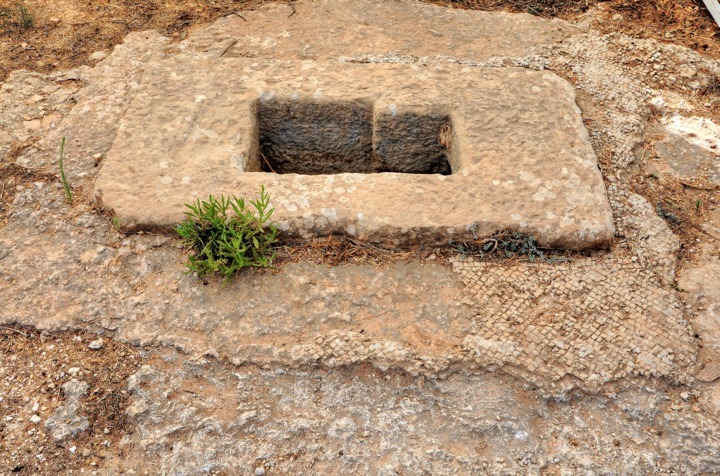 This appears to be the Thormasia of the Talmud... Gurin found here ancient cisterns, cut stones built up in the houses, a broken lintel with a garland carved upon it, and the fragment of a column". In 1978 the community of Shiloh was established east of the ancient mound. Today (2012) the population is about 2500 people. 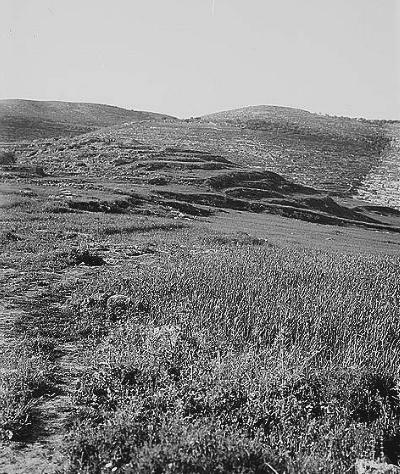 Excavations were conducted here in 1922 (survey by Dr. Aage Shmidt), 1926-1932 (three seasons by a Danish team headed by Hans Kjær ), 1936 (Sven Holm-Nilsen and Marie-Louise Buhl), 1980 (Ephraim Hill country survey), and 1981-1984 (extensive excavations by Bar-Ilan University, headed by I. Finkelstein, Shlomo Bunimovitz and Zvi Lederman). The excavations were renewed in 2010, and in 2012 it was granted 4M$ of Government funding for excavations and preservations, as part of the heritage sites project. 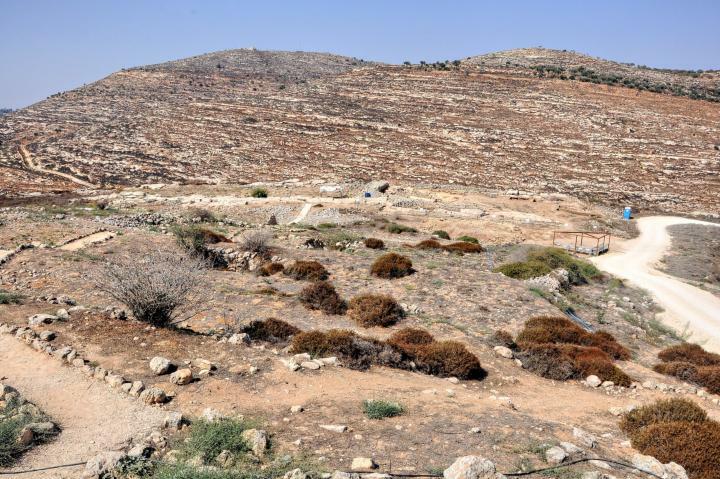 This would become one of the most interesting sites in Samaria - the place where the nation was born. 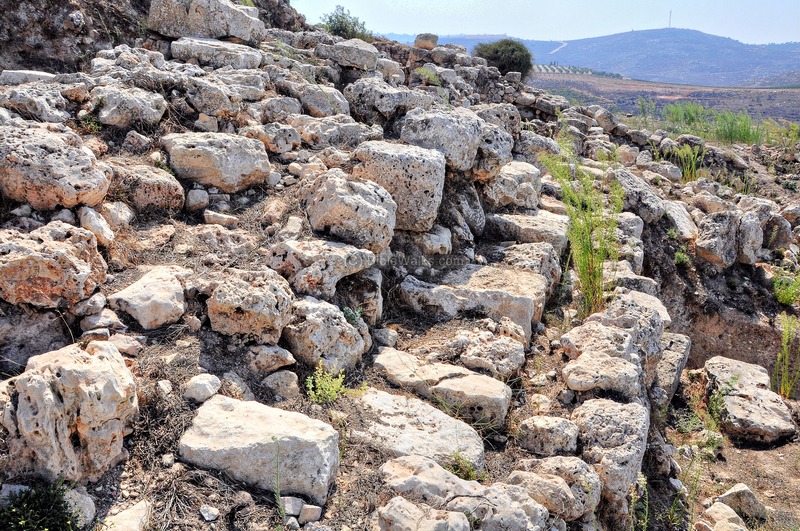 The excavations by Israel Finkelstein revealed that 8 stratums (levels). Destruction by fire, destroyed after Ebenezer battle? 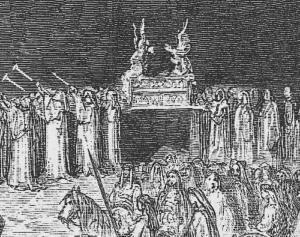 The Tabernacle (Hebrew: "Mishkan") was the portable dwelling place for the divine presence during the Exodus and throughout the conquest of Canaan. The inner place of the Tabernacle (Latin for "tent") housed the Ark of Covenant, while the outer place had a golden lamp stand, table and altar of incense. A detailed description of how to make the tabernacle is provided in chapters 25-27 of the book of Exodus. Here is a prefix of the description (Exodus 25 8-9) : "And let them make me a sanctuary; that I may dwell among them. According to all that I show thee, after the pattern of the tabernacle, and the pattern of all the instruments thereof, even so shall ye make it...". The Ark of Covenant was first housed in a tent, and later was placed in a structure built in Shiloh (Joshua 18 1): "And the whole congregation of the children of Israel assembled together at Shiloh, and set up the tabernacle of the congregation there". 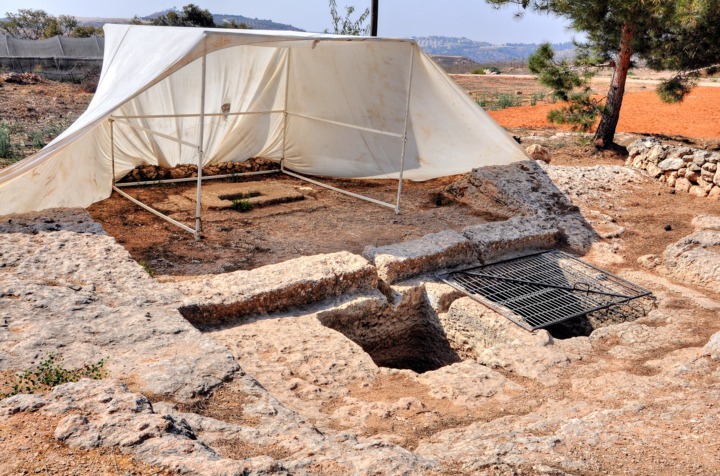 The Mishna - 2nd C AD books of Jewish practices - states that (Zevachim 14): "And in Shiloh there was no roof, but a building of stone below and cloth above, and it was a resting place." A reconstruction of the compound is on display in the visitor center. 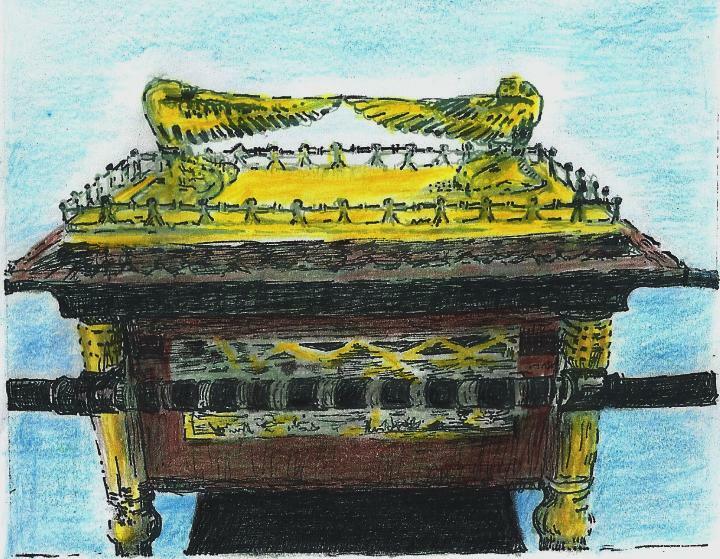 An illustration of the Ark of Covenant, which is seen above inside the golden structure, is shown here. It is based on the detailed description (Exodus 25 10-16): "And they shall make an ark of shittim wood: two cubits and a half shall be the length thereof, and a cubit and a half the breadth thereof, and a cubit and a half the height thereof. And thou shalt overlay it with pure gold, within and without shalt thou overlay it, and shalt make upon it a crown of gold round about. And thou shalt cast four rings of gold for it, and put them in the four corners thereof; and two rings shall be in the one side of it, and two rings in the other side of it. And thou shalt make staves of shittim wood, and overlay them with gold. And thou shalt put the staves into the rings by the sides of the ark, that the ark may be borne with them. The staves shall be in the rings of the ark: they shall not be taken from it. And thou shalt put into the ark the testimony which I shall give thee". Where was the court of the tabernacle located in Shiloh? The Bible instructed a length of 100 cubits (~50m) and width of 50 cubits (~25m), so the area required for the tabernacle was substantial. (Exodus 27, 9-13): "And thou shalt make the court of the tabernacle: for the south side southward there shall be hangings for the court of fine twined linen of an hundred cubits long for one side: And the twenty pillars thereof and their twenty sockets shall be of brass; the hooks of the pillars and their fillets shall be of silver. And likewise for the north side in length there shall be hangings of an hundred cubits long, and his twenty pillars and their twenty sockets of brass; the hooks of the pillars and their fillets of silver. And for the breadth of the court on the west side shall be hangings of fifty cubits: their pillars ten, and their sockets ten. And the breadth of the court on the east side eastward shall be fifty cubits.". However, its precise location is yet a mystery. The scholars suggested different places, but cannot provide solid evidence to support their claims. One suggestion (by Finkelstein) was the summit or the south side of the Tel, but the Iron Age period remains were affected by the layers above it and few remains could verify this hypothesis. Another suggestion (by Wilson) was the north side of the Tel, but that area lacks Iron Age remains. A third option was the area of the churches, south of the hill. The search goes on and hopefully some day new evidence will surface and shed light on the location. On the south and east side of Tel Shiloh are the houses of the modern community of Shiloh (seen here on the right side), and the new structure of the Yeshiva of Shiloh (left side). A view of the north side of modern Shiloh is seen in this next picture, which was taken from the community of Eli. To the west of Shiloh is the road (#60) to the city of Ariel, seen here in the far background. A flight over the site can be seen in the following YouTube video, captured in June 2016. We thank the Park manager Moriah for her assistance and guidance. 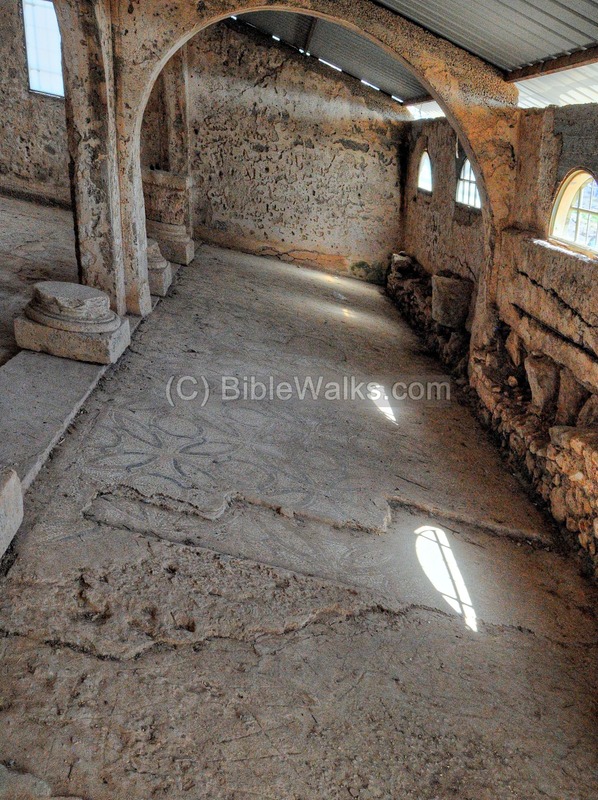 On the south side of Tel Shiloh is a reconstruction of a Byzantine church. The Danish team of the 1930s added the building on top of the Byzantine base. The location of the church is indicated as a red square on the map at the right. It is about 90m away from the southern hillside of Tel Shiloh. A mosque was built on the west side of the ruins, and was named Jamia el Arbain (Arabic: "mosque of the 40"). A view of the structure is shown below. The top of Tel Shiloh, with the tower at the top of the hill, is seen behind it on the left background. 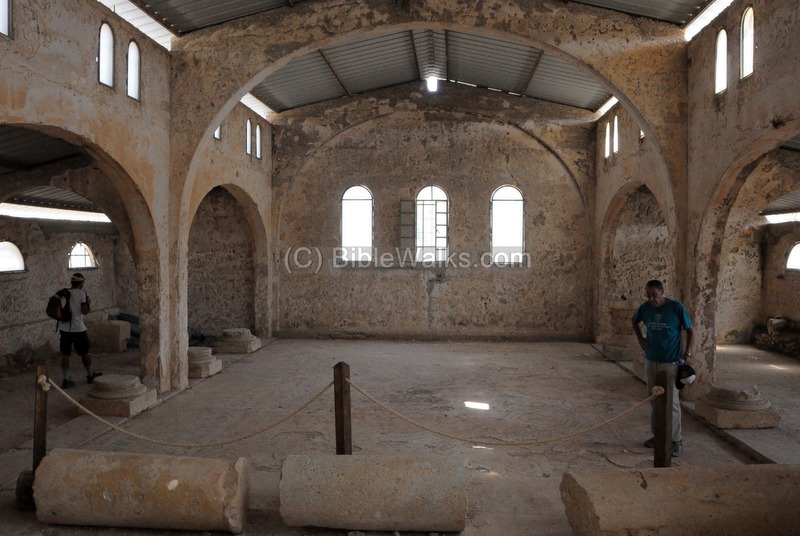 The church was later reconstructed and its interior current state is seen in the picture below. The columns and the lower side of the walls are original, and most of the floor mosaics are original. The design of the church is a basilica, composed of a nave and two aisles, 12 bases and 2 Corinthian capitals. The roof once was covered by rafters that supported the tiles. 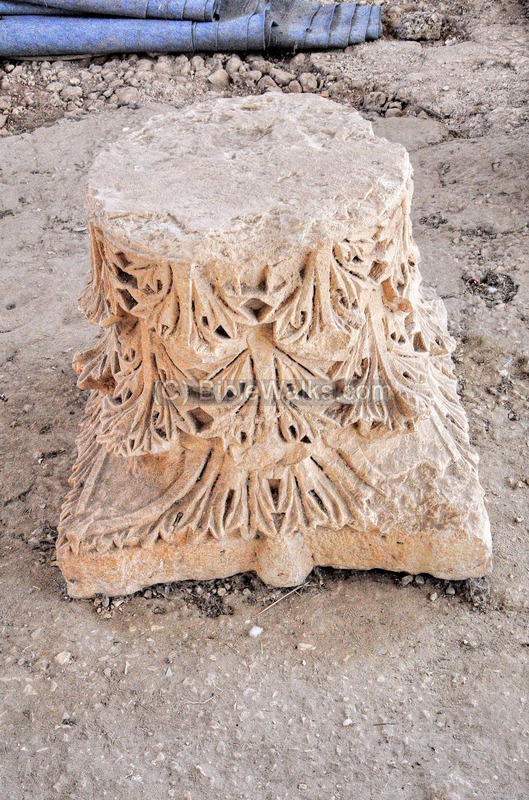 "The most remarkable monument is a little further south, and is now called Jamia el Arbain. This building has two or perhaps three, periods. The main portion is a square, with walls 3 feet thick. On the north is the door 4 feet 8 inches wide, surmounted with a flat lintel stone 6 feet long, 2 feet high, on which are carved two wreaths, flanked by two double - handed pitchers, and in the centre an amphora. On the west wall is another small entrance, surmounted by an arch, slightly pointed, with a keystone. The masonry of the walls is carefully squared and dressed, the stones from 1 foot to 18 inches in length. No masons' marks were found. 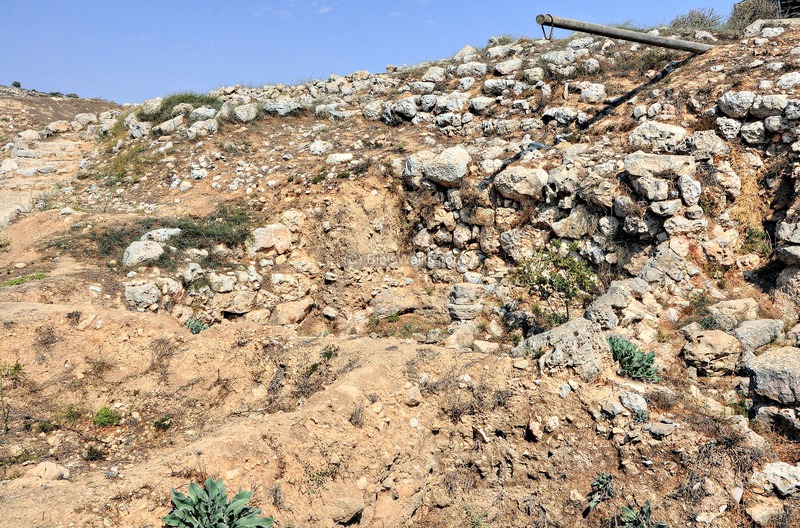 A strong sloping revetment or scarp has been built at a later time against these walls on the north, south and west ; on the latter side it is broken down. It is 13 feet 6 inches high to the top, and 6 feet thick at the bottom, making the wall 3 feet and 9 feet in all at top and bottom. This scarp is of smaller stones and rougher work than the wall it covers, and is evidently a later addition. In the interior of the building are three columns of about 18 inches diameter, lying about ; also a capital with acanthus leaves, apparently belonging to the shafts". The floor is covered by mosaics, featuring intertwining circles and rhombs, icons of plants and complex geometric forms. Some of the figures inside the circles were destroyed, probably by the iconoclastic activists (during the middle 8th C AD, though this extends the time the church was still standing). 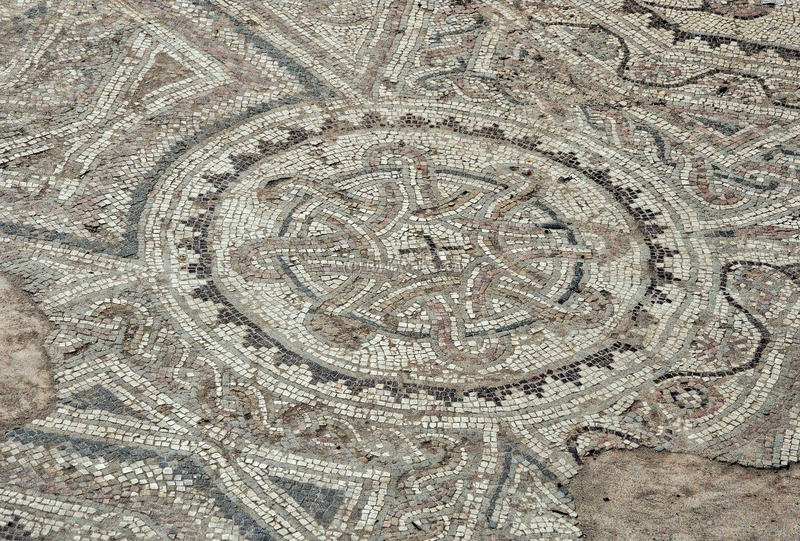 A detail of the floor is shown in the next picture, with a black cross in the center of the circular geometric pattern. The western entrance and narthex of the church is seen here. 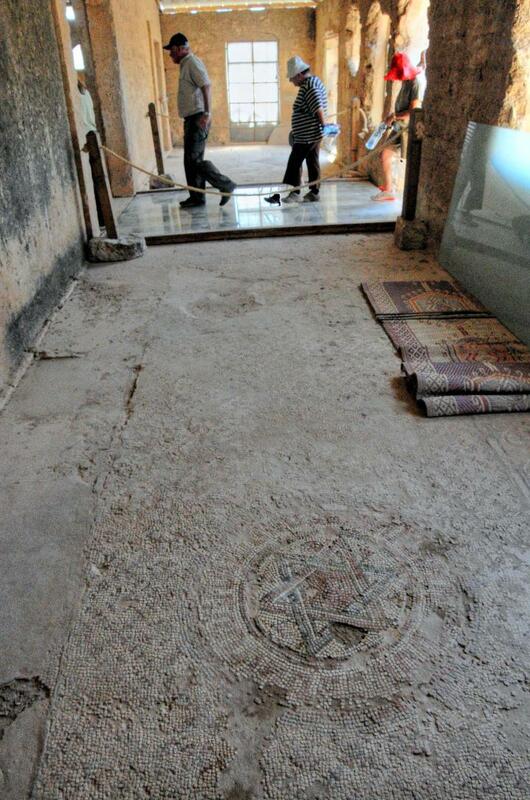 On the bottom of the picture is an interesting symbol of the Star of David. A Greek inscription is located under the glass. 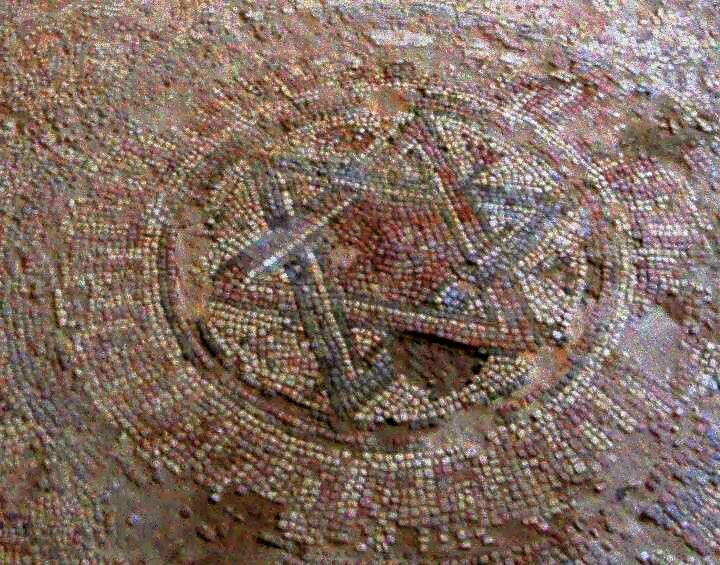 A closer view of the Star of David is below. It is interesting to find this symbol in a church, since it is commonly used to represent Jewish faith. However, this association with Judaism is only in recent centuries, and actually it was a common geometric form used by other faiths as well. More remarkable mosaics from the Churches of Shiloh can be found in the Good Samaritan Inn mosaic museum. On the south side of Tel Shiloh, about 20m from the hillside, is an Ottoman period Muslim structure called Jamia el Yeteim (Arabic: "Mosque of the Orphans"). It is dated to the early middle ages. The location of the structure is indicated as a red square on the map at the right. A view from the hillside on its north side is shown below. Why is it named after the Orphans? Perhaps, this name is associated with the death of Eli, his son and his daughter-in-law after the battle of Ebenezer. The newborn, Ichabod, was born as an orphan (1 Samuel 4 19-21): "And his daughter in law, Phinehas' wife, was with child, near to be delivered: and when she heard the tidings that the ark of God was taken, and that her father in law and her husband were dead... And about the time of her death ... she named the child Ichabod, saying, The glory is departed from Israel: because the ark of God was taken, and because of her father in law and her husband". "South of the village at the foot of the hill is the Jamia el Yeteim, a low building of stone, roughly squared, with a door on the north, and shaded by a fine oak tree. It has a mihrab on the south, and is divided into two aisles, being rather longer east and west than north and south. There is an outer stairway to the roof. South of this is a small birkeh with steps to it". The archaeologists exposed two Byzantine churches under the Mosque, one built in the 6th century and the lower one in the 4th century. 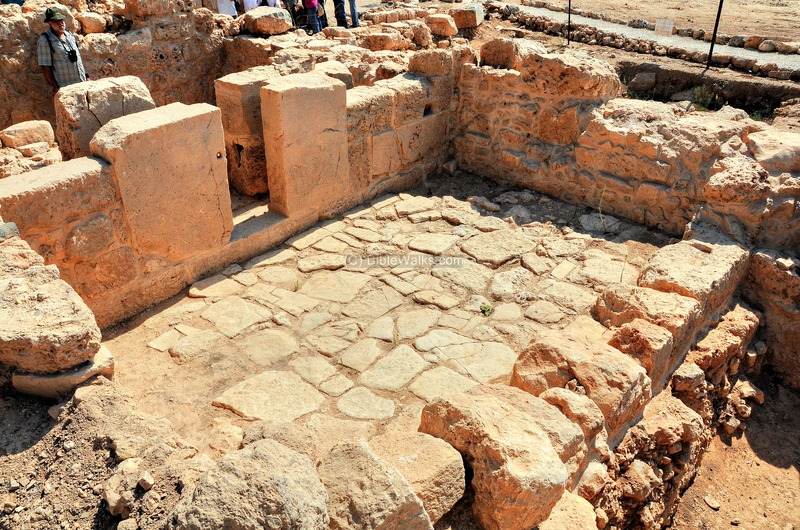 The lower level may have been built over the ruins of an ancient synagogue. The excavators also exposed 6 elaborate mosaic floors, seen in the view below on the front of the building. 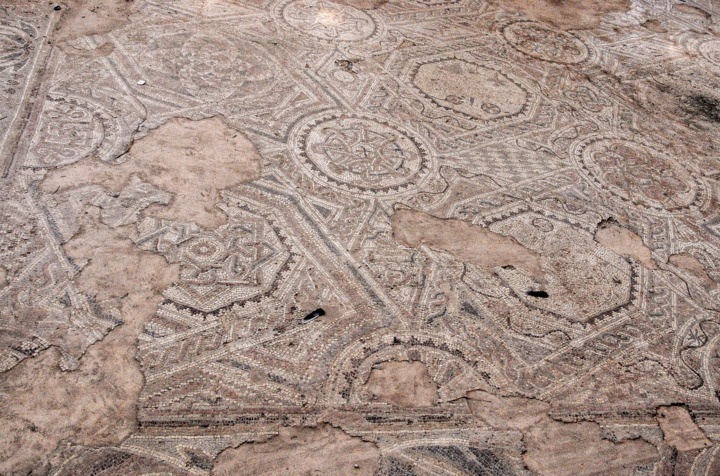 The mosaics included several Greek inscriptions, one of them refers to the place as the "village of Shiloh". On the north side of the structure is the ascent to Tel Shiloh. 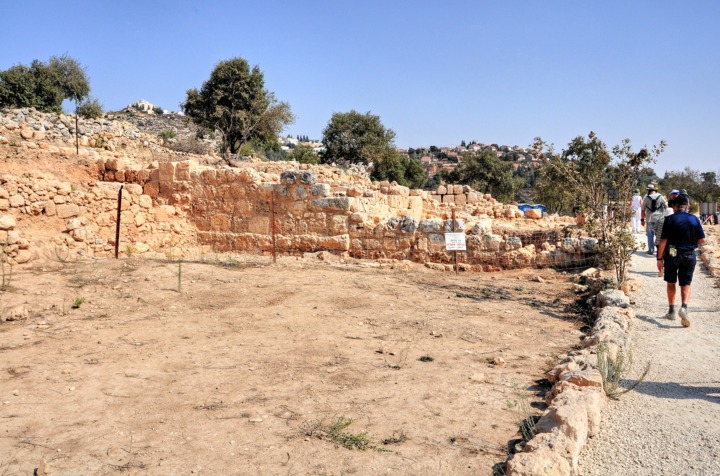 A large Byzantine-period villa was recently unearthed in the south side of the hill, just outside of the Canaanite wall (which is seen on the left side) and close to Jamia el Yeteim. The structure is based on well dressed stones, unlike the rough stones used in the Canaanite period wall. The gate to the room was sealed with a circular stone which was rolled between the vertical standing stones in order to seal it. A closer view of the gate is seen in the next photo. The rolling stone was moved inside the gap in order to block the entrance to the structure. Panoramic view: A panoramic view was taken from the south side of the Tel. If you press on it, a panoramic viewer will pop up. Using this flash-based panoramic viewer, you can move around and zoom in and out, and view the site in full screen mode. 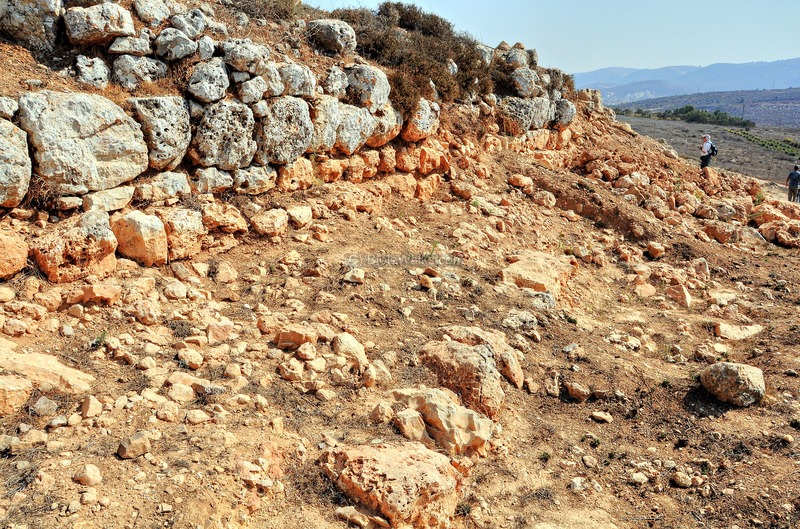 The massive Middle Bronze wall was constructed at 1650-1600 BC, and surrounded the hill. 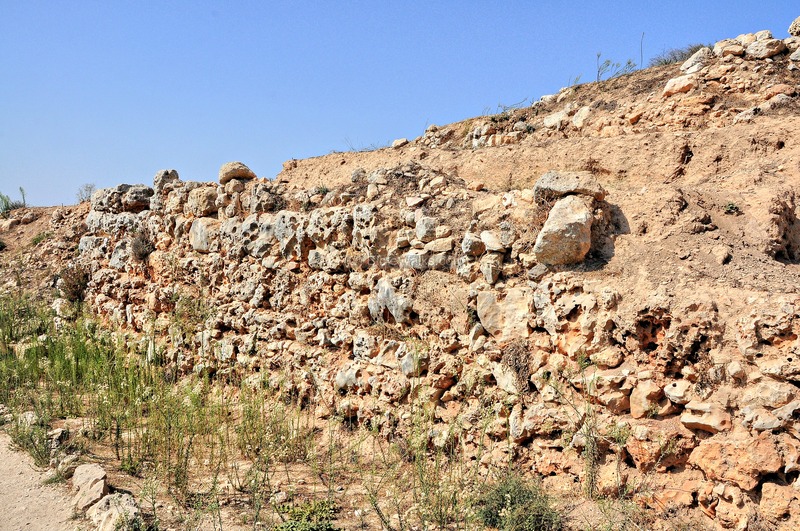 The size of the area behind the wall was 17 Dunam (17,000 square meters, or 1.7 hectares). The wall was built on top of the bed rock, and was based on large unhewn stones. Some of the stones were cut on the edges. Behind this wall was a fill composed of large and medium size unhewn stones. The width of the wall varied (3.0m to 5.5m). On the exterior side of the wall was a wide earthen glacis. The coarse locations of the wall is indicated as a red dots on the map at the right. 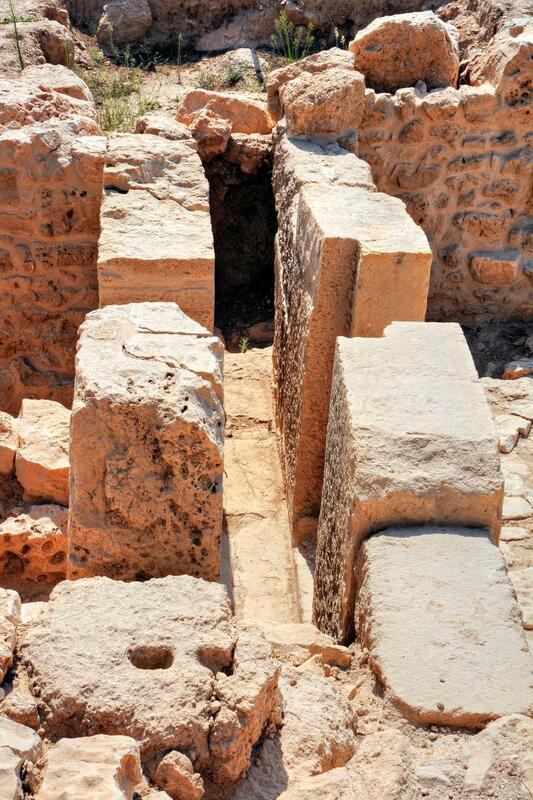 Sections of the wall were excavated in several squares along the wall. A view of a section of the wall is seen in the following photo. The earthen glacis before the wall was 25m wide (! ), ascending a height of 6.3m, about 1m lower than the height of the stone wall. It had a 25 degrees incline - closely matching the slope of the bedrock. In one of the excavated sections ('D') the glacis was composed of 4 main layers: a harden top layer in brown-reddish color, a soft white layer below with small stones, a brown or red or white soil on the 3rd layer, and a grey-yellowish layer at the lower layer. Notice the large rough stones on the top side of the wall, and smaller stones on the bottom. Iron age structures were found on the western side of the Canaanite wall, in area "C". Dozens of large, Israelite-period rim-collared jars were found here standing along the walls of the rooms. 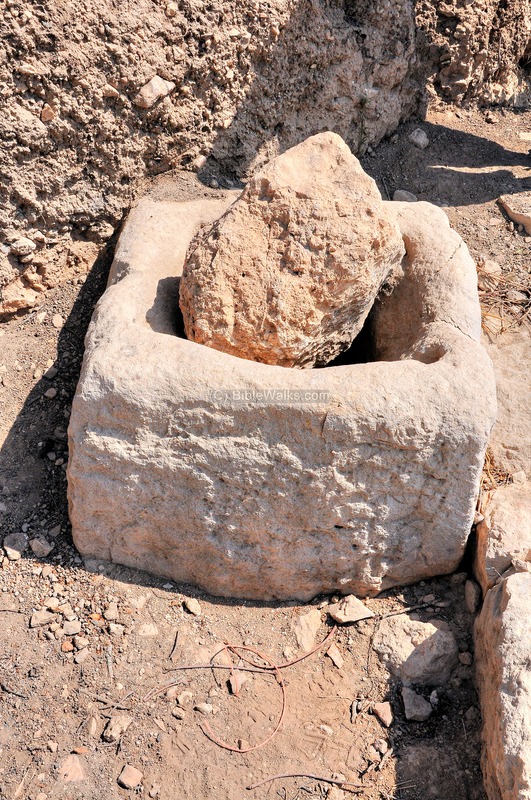 These contained oil and wine, which was probably in use for the service of the Tabernacle (Mishkan) - the Biblical place of worship in Shiloh. The location of the area of the Iron Age store rooms is indicated as a red square on the map at the right. A view of the rooms with the Iron age findings is seen below. They are located outside and just below the Canaanite wall. The structures are dated to the period of Eli and Samuel. They were built on the external side of the Canaanite wall, and so sections of the glacis were removed in order to build the rooms. 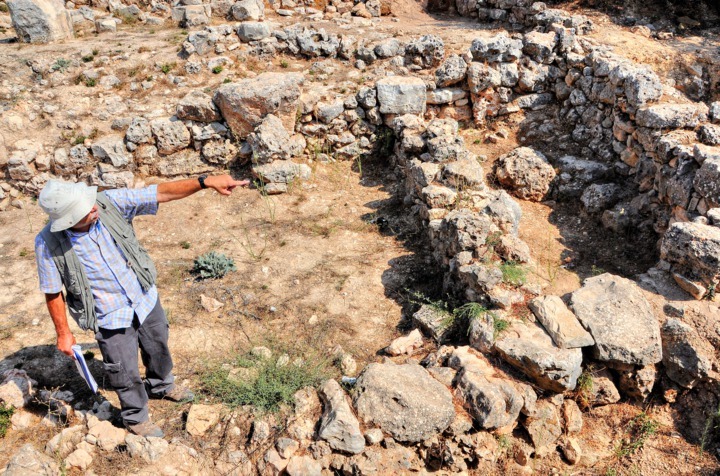 Dr. Arie Bornstein, who guided the tour, points out to the Iron Age rooms. Outside of the Canaanite wall, within a shaft, were fragments of shreds and animal bones which were probably used to store the remains of the sacrifices. In the excavations of 2013, a broken Iron Age stone altar was found in the wall of a Byzantine structure. It measures 60 x 60 cm, 40 cm high, with a corner horn 12 cm high and 18 cm long. 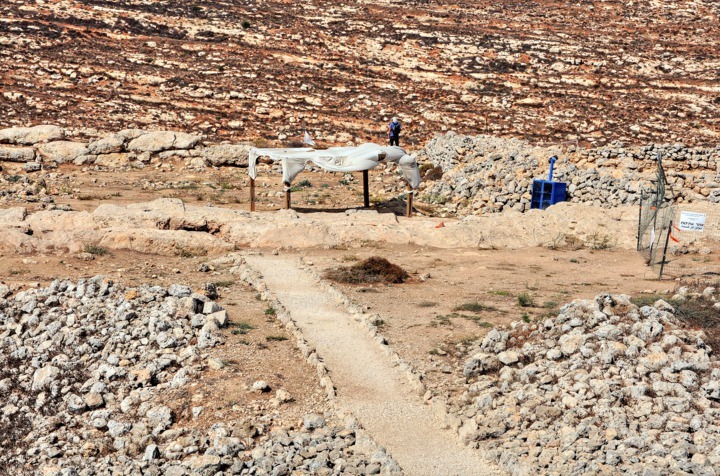 The archaeologists assume that the original site of the altar was located in the south side of Tel Shiloh. 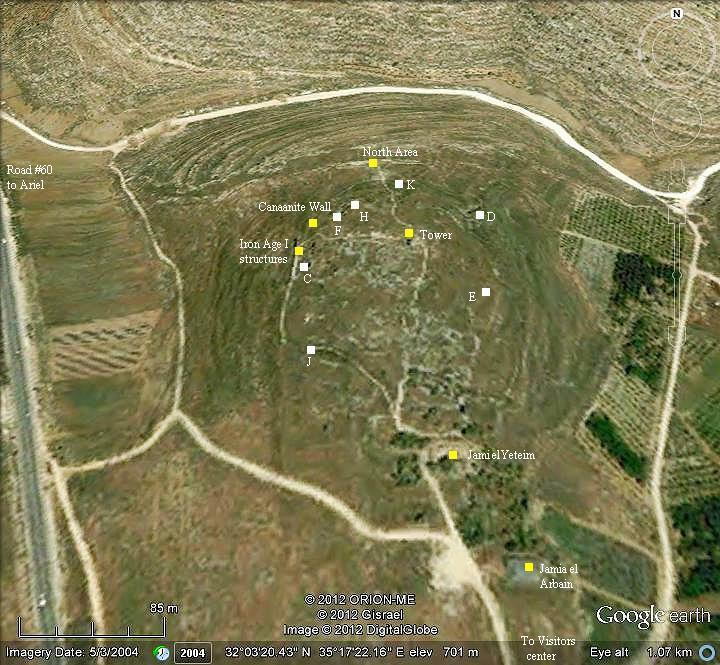 One of the potential areas of the Tabernacle is on the west side of Tel Shiloh. 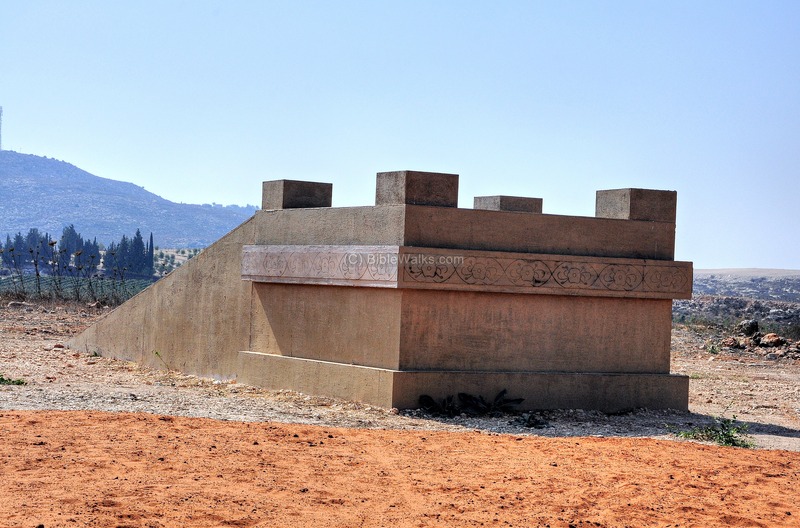 This is a flat area which is large enough to fit the tabernacle - 50m wide by 100m long, with east-west orientation - just as required by the Biblical instructions. The location of the flat area is indicated as a red square on the map at the right. The flat area is seen below in a view from the watch tower towards the north. Just in front, half way down the hillside to the flat area, is the Canaanite wall. The rectangular bedrock area is oriented east-west. On the west side of the area are rock carvings, one of them used as a winepress. Panoramic view: A panoramic view was taken from the watch tower, overlooking this area. If you press on it, a panoramic viewer will pop up. Using this flash-based panoramic viewer, you can move around and zoom in and out, and view the site in full screen mode. Hot spot markers provide pointers to important places. 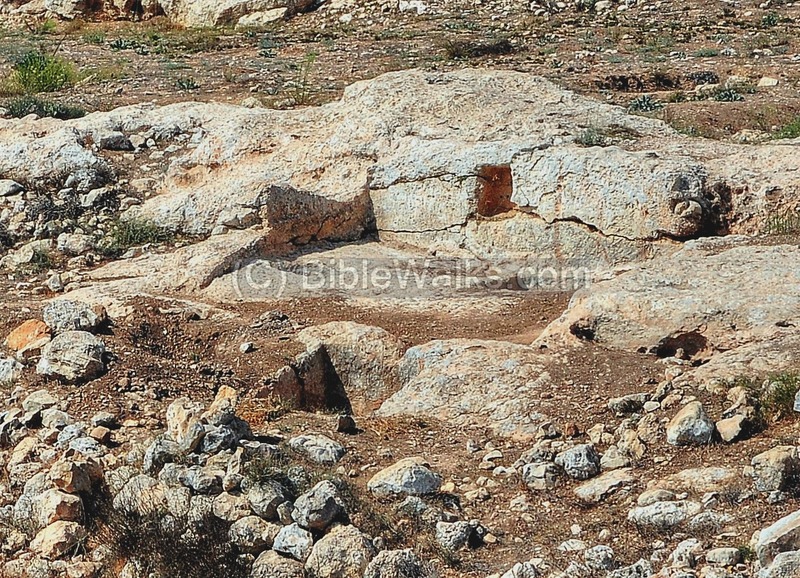 Another theory was that the tabernacle was located on the top of Tel Shiloh, seen in this view. However, the small size of the area makes this location problematic. This picture shows a view from the top towards the south. 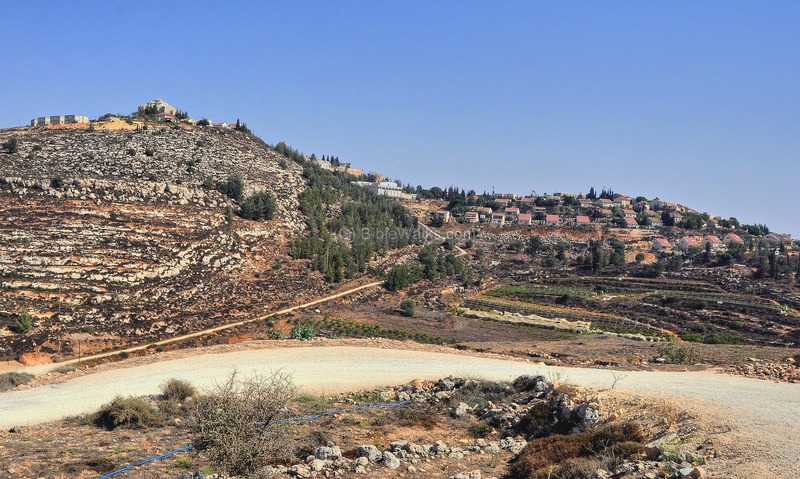 A 360 degrees panoramic view, as seen from the top of Tel Shiloh, in shown in the following picture. If you press on it, a panoramic viewer will pop up. Using this flash-based panoramic viewer, you can move around and zoom in and out, and view the site in full screen mode. Hot spot markers provide pointers to important places. A model of an Israelite altar is located 250m south of the hill. This altar design was probably also located in Shiloh. It is based on the Biblical and Mishna descriptions. (Ezekiel 43 13-20): "And these are the measures of the altar after the cubits: The cubit is a cubit and an hand breadth; even the bottom shall be a cubit, and the breadth a cubit, and the border thereof by the edge thereof round about shall be a span: and this shall be the higher place of the altar. And from the bottom upon the ground even to the lower settle shall be two cubits, and the breadth one cubit; and from the lesser settle even to the greater settle shall be four cubits, and the breadth one cubit. So the altar shall be four cubits; and from the altar and upward shall be four horns. And the altar shall be twelve cubits long, twelve broad, square in the four squares thereof. And the settle shall be fourteen cubits long and fourteen broad in the four squares thereof; and the border about it shall be half a cubit; and the bottom thereof shall be a cubit about; and his stairs shall look toward the east. And he said unto me, Son of man, thus saith the Lord GOD; These are the ordinances of the altar in the day when they shall make it, to offer burnt offerings thereon, and to sprinkle blood thereon. And thou shalt give to the priests the Levites that be of the seed of Zadok, which approach unto me, to minister unto me, saith the Lord GOD, a young bullock for a sin offering. And thou shalt take of the blood thereof, and put it on the four horns of it, and on the four corners of the settle, and upon the border round about: thus shalt thou cleanse and purge it". 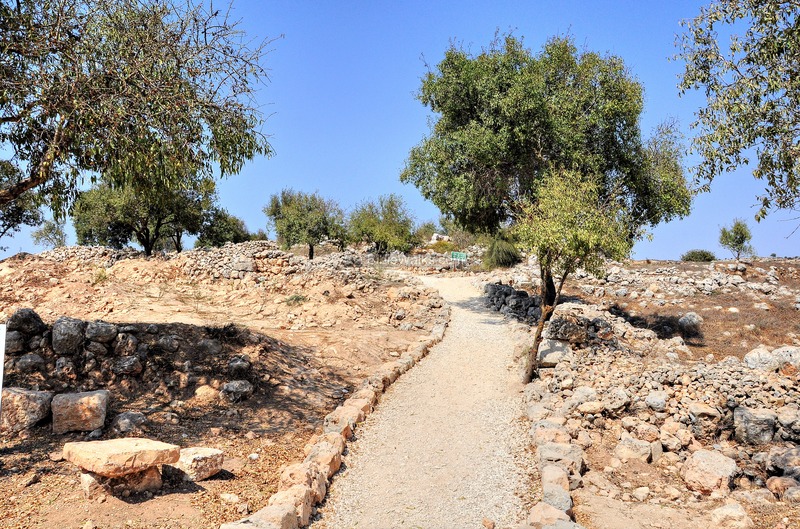 Shiloh was the religious capital of Israel during the times of the Judges, an assembly place for the people of Israel and a center of worship. Several Iron Age altars were found in the recent years on and around Tel Shiloh. See separate page on the altars around Shiloh. 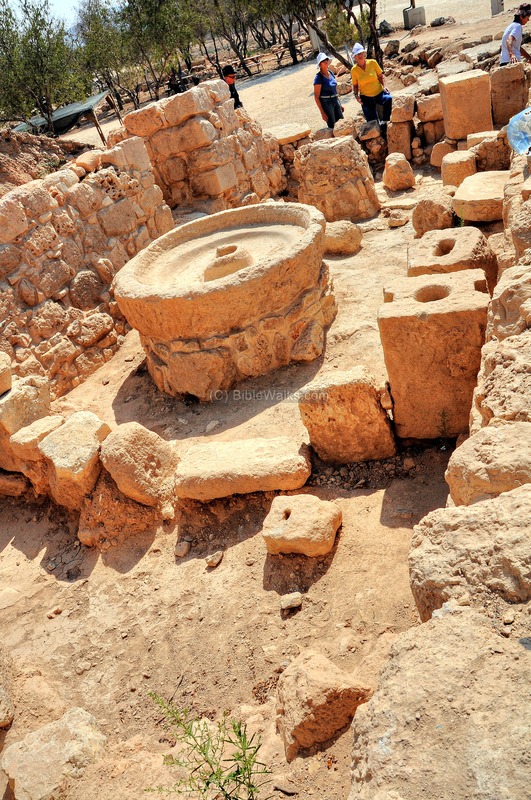 An impressive rock hewn wine press is located 320m south of the Tel. It is dated to the 1st C AD. The location of the wine press is indicated as a red square on the map at the right. The photo below shows the wine press installation, which consists of a treading floor and twin collecting pits. The treading floor, covered by mosaics, is where the grapes were laid and crushed by the feet of the workers, extracting the juice. The juice and grapes were left to sit during the fermentation process. A small rectangular hole in the center of the treading floor - for secondary crushing of the grapes, using a single fixed-screw press. The press squeezed out the must left in the grape skins and stalks after treading. After the fermentation process, the wine would let to flow down to the pool through the filter notches, seen below on the left sides. The purpose of the filter is to let only the juice flow through, while the grape shell and pits remain in the treading floor. The twin collecting pools are where the juice accumulated. They are lower than the treading floor, so the juice flows down into the pools. 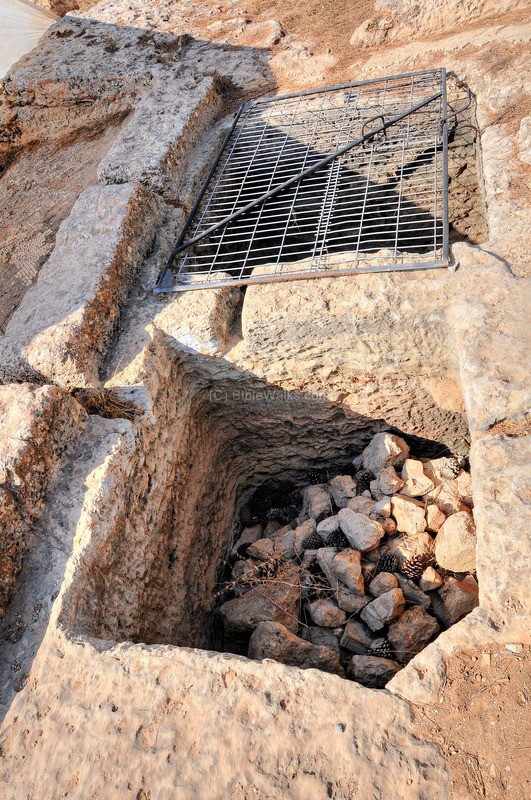 Another winepress is located on the north side of the hill, at the area where some of the scholars suggest as the place of the tabernacle. The treading floor is located on the far north side, while the collecting pool is on the closer side. See more information and samples on winepresses in our info page. "And the word of Samuel came to all Israel. Now Israel went out against the Philistines to battle, and pitched beside Ebenezer: and the Philistines pitched in Aphek. And the Philistines put themselves in array against Israel: and when they joined battle, Israel was smitten before the Philistines: and they slew of the army in the field about four thousand men. And when the people were come into the camp, the elders of Israel said, Wherefore hath the LORD smitten us to day before the Philistines? Let us fetch the ark of the covenant of the LORD out of Shiloh unto us, that, when it cometh among us, it may save us out of the hand of our enemies. So the people sent to Shiloh, that they might bring from thence the ark of the covenant of the LORD of hosts, which dwelleth between the cherubim: and the two sons of Eli, Hophni and Phinehas, were there with the ark of the covenant of God. And when the ark of the covenant of the LORD came into the camp, all Israel shouted with a great shout, so that the earth rang again. And when the Philistines heard the noise of the shout, they said, What meaneth the noise of this great shout in the camp of the Hebrews? And they understood that the ark of the LORD was come into the camp. And the Philistines were afraid, for they said, God is come into the camp. And they said, Woe unto us! for there hath not been such a thing heretofore. Woe unto us! who shall deliver us out of the hand of these mighty Gods? these are the Gods that smote the Egyptians with all the plagues in the wilderness. Be strong and quit yourselves like men, O ye Philistines, that ye be not servants unto the Hebrews, as they have been to you: quit yourselves like men, and fight. And the Philistines fought, and Israel was smitten, and they fled every man into his tent: and there was a very great slaughter; for there fell of Israel thirty thousand footmen. And the ark of God was taken; and the two sons of Eli, Hophni and Phinehas, were slain". Shiloh - Biblical name of the city, with unknown meaning. Z. Vilanai suggests it means serenity or rest (from Hebrew: Shalva) after the rough years of Exodus and Conquest. This is based on Deuteronomy 12 9: "For ye are not as yet come to the rest and to the inheritance, which the LORD your God giveth you". Khirbet Seilun - Arabic name of the site, which preserved the ancient name of Shiloh.